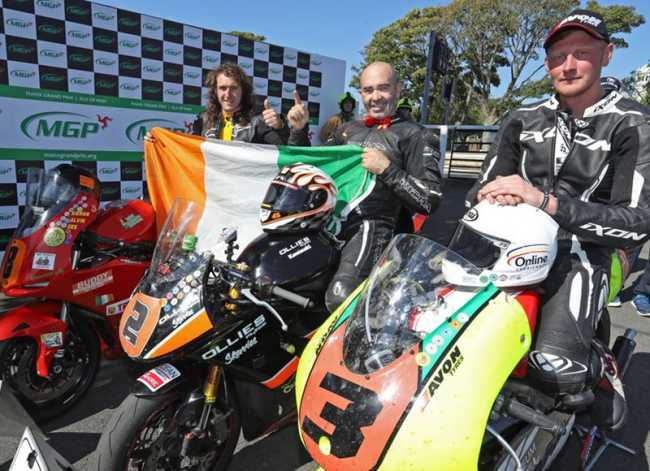 Ireland’s Andrew Farrell won a dramatic Manx Grand Prix Supporters Club MGP Lightweight Race 2, following up his victory in the first Race earlier in the week, but the race was decided on the last lap when race leader James Chawke retired while leading by over fifty seconds. There was also a second win for Darryl Tweed in the concurrent MGP Ultra Lightweight Race. Following Monday’s thrilling MGP Lightweight Race, the second iteration was eagerly anticipated on the final day of the Manx Grand Prix Races. After a thirty-minute delay to allow the course to dry from the overnight rain, the MGP Supporters Club Lightweight and Ultra Lightweight Race got away at 10.45. Spain’s Victor Lopes Santos – the fastest qualifier in the Lightweight Class - who was away at number 1, was an early retirement at Quarterbridge while Nigel Rea was also reported as a retirement on the opening lap at the Highlander, approximately five miles into the race. James Chawke, looking for his second MGP win of the week following victory in Wednesday’s Junior MGP Race, was first to Glen Helen on the opening lap, a second ahead of Dave Butler with Gary Vines a further second back in third, fractionally ahead of Dave Lumsden. Wednesday’s Lightweight Race winner Andrew Farrell was over three seconds behind the early race leader in fifth place. James Chawke was black flagged at Sulby, however, nothing was found to be wrong with the bike, so he was credited with the time lost and continued to lead by five seconds from new second placed man Gary Vines with Dave Butler third. Farrell had moved into fourth at the Bungalow on the opening lap with Lumsden completing the top five. Farrell was first through the grandstand with his opening lap of 112.695 which put him in third place, but he was already over ten seconds behind James Chawke after his opening lap of 113.664. Gary Vines was second to Chawke, 8.4 seconds behind the race leader. Dave Butler (112.374) came in to the pits in fourth place at the end of the opening lap for a quick ‘splash and dash’ fuel stop which put him over a minute behind the race leader with Lumsden (111.822) completing the top five. With Butler dropping to seventh at Glen Helen on the second lap following his pit stop, Gareth Evans moved into the top five but out at the front of the field, Chawke had extended his lead to a healthy nine seconds at Glen Helen on the second lap. At the end of the second lap Chawke’s set a new lap record of 114.993, all the more remarkable because he was slowing down to come in to the pits which put him fifteen seconds ahead of Gary Vines (114.993). Vines lost time in the pits with a stop of 1:08.26 while Andrew Farrell, running in third after a lap of (113.652), also lost time on the race leader with a stop of over a minute by overshooting his pit. After the pits, Chawke was now over forty seconds in front of new second placed man Butler who ran through on the second lap and moved back up the field. Butler’s lead was only a second and a half over Farrell with Vines lengthy pit stop dropping him to fourth, two tenths of a second behind Farrell. David Lumsden, a further thirteen seconds behind Vines, completed the top five at Glen Helen on the third lap. Chawke was even further in command by the end of the third lap (110.785), leading second placed man Farrell by over fifty seconds. But there was a battle Royale brewing for the remaining podium places with Farrell’s lead at the end of lap three only a second from new third placed man Butler with Vine just over half a second further back in fourth. However, there was drama on the last lap with Chawke retiring at Ballagarey which meant that there was now a thrilling battle for the Lightweight MGP Race win. Farrell was the new race leader at Glen Helen on the last lap, three seconds ahead of Vines with Butler less than half a second further back in third. Farrell powered over the mountain to take the chequered flag with a final lap of 114.650 to win by six seconds from Gary Vines with Dave Butler a further three seconds back in the final podium place. David Lumsden was fourth but with Chawke’s retirement, and fifth placed rider Gareth Evans also a retirement at Casey’s on the last lap, newcomer Michael Rees, in an impressive performance, completed the top five. In the concurrent 3 lap Ultra Lightweight Race, Darryl Tweed continued his form from Wednesday’s Race win to lead by almost seven seconds from Steve Moody at Glen Helen on the opening lap with Mike Carter almost four seconds further back in third and Alex Sinclair and Daniel Ingham rounding out the top five. Tweed’s opening lap of 105.839 gave him a lead of over thirty seconds from Steve Moody with Tom Snow (103.193) holding third and Ingham and Sinclair fourth and fifth respectively. Sinclair and Moody elected to pit at the end of the opening lap which saw Andrew Cowie and Mike Carter move ahead of them into the top five, with Sinclair now sixth, twenty seconds behind Carter. Tweed came into the pits at the end of the second lap with a pit stop of 48 seconds, but with both Snow and Cowie electing to run through, Tweed’s lead was thirteen seconds at Glen Helen on the third lap with Ingham and Sinclair completing the top five. Tweed’s last lap of 103.026 gave him victory by almost thirty seconds from Tom Snow with Andrew Cowie clinching the final podium place. Ingham was reported as a retirement on the last lap at Joeys which saw Alex Sinclair move into fourth with Steve Moody completing the top five. Paul O'Rourke was taken by airmed to Noble's Hospital following an incident at the Bungalow where he was reported to have sustained hand and hip injuries while Japan’s Yoshihiro Kishimoto was unhurt following his accident at Sulby Bridge. Alan Thomas’s accident at Greeba Castle saw him transferred to Noble's with a leg fracture. Manx Grand Prix Lightweight race.